What makes YOU feel empowered? How do you empower OTHERS? As you read, you're invited to identify habits that you ALREADY utilize with success and chose one habit that you'd like to cultivate to catalyze even more success. Did you know that our minds are hardwired to look for the negative? While negativity bias helped keep our ancestors safe from predators like lions, tigers and bears, it can also cause people to fall into the "admiring the problem" trap. To help overcome this obstacle, we can identify and invest in strengths (ours and others) to serve as a springboard for more success! An empowering question to consider: What are our strengths and how can we use them as a springboard for success today? As Simon Sinek teaches, connecting to your "why", your larger purpose, before focusing on “what” and “how” can also serve as a catalyst for growth. If you think about some of the amazing people in YOUR life who have made an impact, its likely that were times when they faced obstacles and persisted in part because they had their eyes on a bigger prize, a larger purpose or why. An empowering question to consider: How do I want to make the world a better place? What power is accessible to me when I connect to my WHY? Pointing a finger at what is wrong can feel temporarily satisfying. However, it can be empowering to take another step. When we look beyond the current reality to the possibility and potential in people and situations, the sky becomes the limit. When you assume that the potential is in someone (and not something you have to fill them with), this is a game changer. Empowering questions to consider: If I were to put on special glasses that only saw potential, what would I see in myself? What would I see in others? How might I call out and invest in that potential? Your brain changes when you adopt a gratitude attitude which is a focus on what you can be grateful for regardless of the situation. Research shows that expressing and/or writing down 4 things you are grateful for daily helps lead to long-term, sustained happiness. An empowering question to consider: What am I thankful for right now? Historically, schools in the USA have focused on rational learning (the head). Broadening our lens to understand that every human being has emotions (heart) and the desire to take constructive action together (hands) can be empowering. An empowering question to consider: How might we build upon our passion (heart), knowledge and experience (head) to create positive action (hands) together? Everyone has a story waiting to be told. Most people yearn to be part of a larger story of community and connectedness. To quote Karl Meninger, “Listening is a magnetic and strange thing, a creative force. The friends who listen to us are the ones we move toward. When we are listened to, it creates us, makes us unfold and expand.” Investing in skills like paraphrasing, a listening tool, can be empowering. Empowering questions to consider: What is MY story? What is this person's story? How might I support people in feeling seen and heard? People are different with unique strengths and perspectives. Creating the conditions where people feel comfortable being different can help invite the sharing of strengths and ideas. Empowering questions to consider: What is a possible next step we could take to create an climate of safety and respect? How might we celebrate the value that each of us brings and build based on our unique strengths? As Dr. Carol Dweck teaches, a growth mindset (I can improve through effort) differs from a fixed mindset (I am who I am and its not really going to change). We are more apt to seek out challenges and grow when we know that “failure” is part of the growth equation. Once we F.A.I.L. (First Attempt In Learning), we can use our effort as fuel to learn and try again with new wisdom and experience. An empowering question to consider: How might I use "failure" as the fuel for future success? Sometimes, it can be tempting to reach for a “baindaid” approach to student behavioral issues. However, below the actual behavior (the tip of the iceberg) lies deeper underlying causal factors like the person’s thoughts, emotions and needs. By empowering ourselves and our students with proactive strategies (wellness practices, communication skills, etc) to support what is underneath the surface, we can cultivate long term success. An empowering question to consider: If I were to look underneath the person's behavior to the iceberg (root causes) below, what emotions (excitement, sadness, anger, happiness, fear, etc.) or needs (safety, connection, respect, trust, etc.) might I find? We’ve all heard about giving someone a fish to eat for today versus teaching them how to fish for a lifetime. When we help others get in touch with their strengths, purpose and growth mindset, we are teaching them how to fish. We are not only supporting them as they develop their internal resources to become lifelong learners. We're cultivating empowered change agents, one successful student at a time. Empowering questions to consider: What are my students capable of as they tap into their internal resources and take more responsibility for their success? How might I help others cultivate their power within? 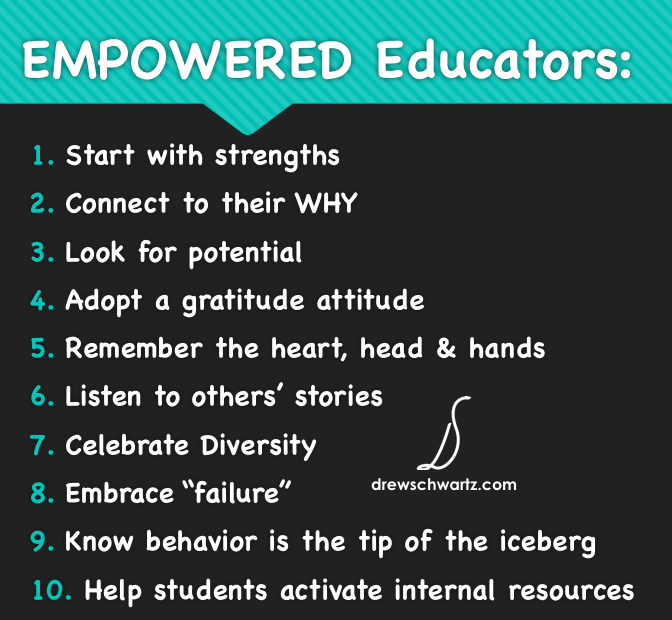 As you practice the 10 Habits of Empowered Educators, you are helping to lead the way with the growing Empowered Schools Movement which is focused on transforming our schools into strength and purpose driven communities of learning and thriving. Congratulations! Your actions are changing the world, one student at a time.